Heating Plastimake to 60°C (140°F) will cause it to transform from hard white pellets into a soft, transparent blob. As it cools it will become white and rock hard again. You can heat and cool Plastimake as many times as you like without damaging it. Hot water – The simplest and safest method is to pour boiling water into a container and drop in your Plastimake pellets. The pellets will soften quickly and begin to stick to each other, forming a soft transparent blob. Rice cooker or Slow cooker – Both these devices will get get the water hot enough to melt Plastimake. They can be particularly convenient f you're working on a large Plastimake project as you won't need to boil the kettle again and again. 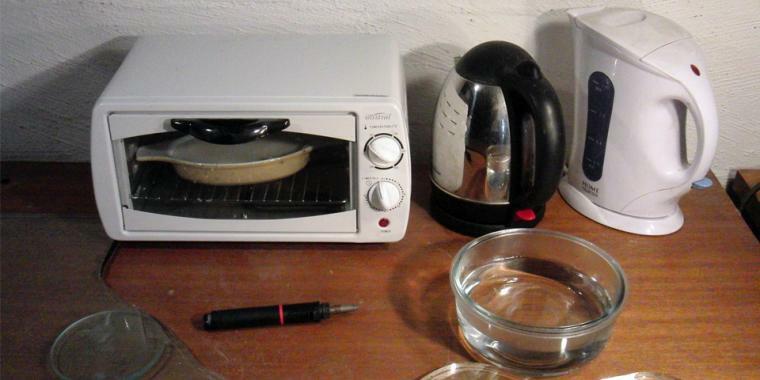 Microwave – Put your Plastimake in a microwave safe container and heat in 10-20 second bursts, checking after each burst. Be extremely careful when heating Plastimake in your microwave, it can get very hot very quickly. Oven – Put your Plastimake on a clean ceramic, metal or silicone baking tray and set your oven to 70°C. Bake until your Plastimake becomes soft and transparent. Baking is a great way to soften large pieces of solid Plastimake. Heat-gun and Hair dryer – These tools are really useful for heating specific parts of a solid Plastimake object. Here at the Plastimake Lab we use a heat-gun attachment on a small butane torch, it works great! Cigarette lighter - A cigarette lighter is effective for heating small parts of an existing Plastimake object. It's especially useful for heating the surfaces of two pieces that you want to join together. Note that the open flame can sometimes leave traces of black soot on the surface of your object. Safety first! Never heat Plastimake above 70°C. It doesn’t make it easier to work with, you just increase the risk of burning yourself. Heating Plastimake to temperatures over 200°C will damage the polymer. Large pieces of Plastimake will take much longer to heat up compared to smaller pieces. That's why we supply Plastimake in pellet form - so it's quick and easy for you to soften it in hot water! It’s a good idea to cut your left over Plastimake into small pieces when you're finished. That way they'll be much easier to soften next time.